The Alpinestars Stella Hyper Drystar Pants are a great option for the woman that wants protection and durability, in a sleek style. 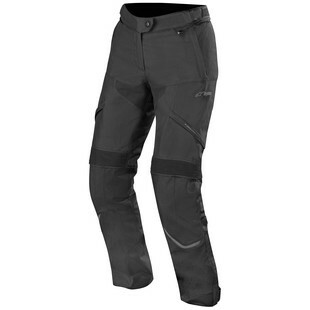 These pants have the Drystar liner built in to help keep you dry, the thermal liner to keep you warm, but there are also multiple ventilation zippers that will help you regulate the temperature when needed. Pair it with your favorite Alpinestars Jacket to complete the setup for full coverage. There are large stretch panels and the legs are pre-curved, which will increase the comfort these pants offer when you are on the bike. If protection is a must have for you, these pants are a great contender since they come with CE certified knee armor and are ready for the hip armor to be added in. With the clean, fresh styling and the protective qualities of the Stella Hyper Drystar Pants, you can’t go wrong with riding in these. Ride fun, ride safe, ride always!